I hardly ever promote products here at Dances with Wools, but when I saw this cowl, I just had to post it. The designer, Caroline Sommerfield, is a dedicated animal rights activist. She created a line of cat and dog colored yarns called – what else? – Meow and Woof, and donates proceeds to rescue and adoption agencies, spaying and neutering programs, and trap-neuter-return programs that support feral cat colonies with safe shelter, food, and vet care. What a brilliant way to combine the love of knitting with love of animals! Those two things are also close to my own heart; hence, this post. This particular cowl is made in Silver Tabby Ursula, and features tabby style stripes interspersed with little paw prints. Caroline’s company, Ancient Arts Fiber Crafts , features other kitty color ways in the Meow line, as well as an array of other yarns, patterns, and kits, along with a list of retailers. You can order the Lovecats Cowl Kit , which is $39.99, here . Some knitters find garter stitch to be tedious, and avoid it whenever possible. But as this cowl shows, garter doesn’t have to be boring. In fact, it lends itself quite nicely to shaping, in a neat, tailored sort of way that stockinette or fancier stitches can’t quite match. This design combines short row triangles with rectangles, and one of the things that appealed to me when it caught my eye on the Purl Soho site this afternoon is the way it drapes without bunching up around the neck the way many cowls do. I also like the stitch definition that the yarn, Cashmere Merino Bloom, produces. Having now knitted several garments from Purl Soho kits, I can testify to the excellent quality of their yarns. Pivot is made on size 5 US straight or circular needles. As soon as I finish the Purl Soho Drachenfels shawl that currently occupies my needles, the Pivot Cowl may just be my next project. Just back from a Caribbean vacation, where knitting took a back seat for a week. Settling in at home today, catching up on email, etc, I found this lovely, lacy cowl pattern from Tahki Stacy Charles. Named for the canals in the Jordaan section of Amsterdam, it’s made on size 9 (US) needles with two laceweight yarns held together. The free pattern is available for upload here. You can order the yarns from the TSC site if you like. Lion Brand has come a long way, baby, since the days of their generic acrylic yarns in basic colors. Last month, a friend asked me to crochet a cowl for her, using a pattern she found on the net. I prefer knitting to crochet, but the cowl came out so beautiful that I just had to make one for myself, in the same colorway (Lion Brand Homespun, in Tudor, a blend of natural, blues, and lavenders.) The original sports a button closure, which I decided to forego in favor of joining the edges to make a ring. The pattern can be purchased at etsy. Lion Brand has a similar pattern, free of charge, here. 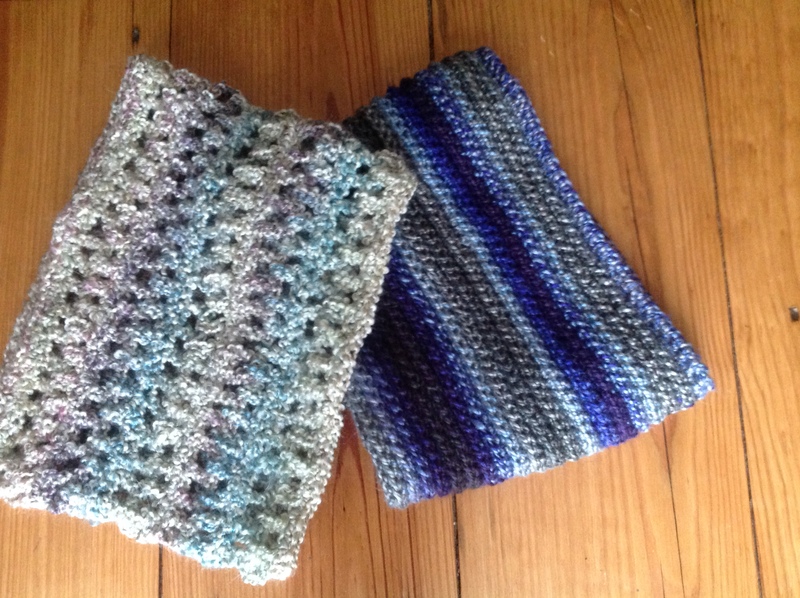 The single crochet cowl, in Lion Brand’s new line, Unique (I used 2 skeins in Oceania), is very simple to make, mostly single crochet through the back loop. That pattern can be found here. Both of these creations elicit admiration each time I wear them, and they’re both nice and cozy.